Hidden away in the heart of the newly coined “Arts District” that is transforming the grungy old industrial neighborhood of Downtown Los Angeles is, believe it or not, a trattoria-style Italian restaurant that just opened in 2013. 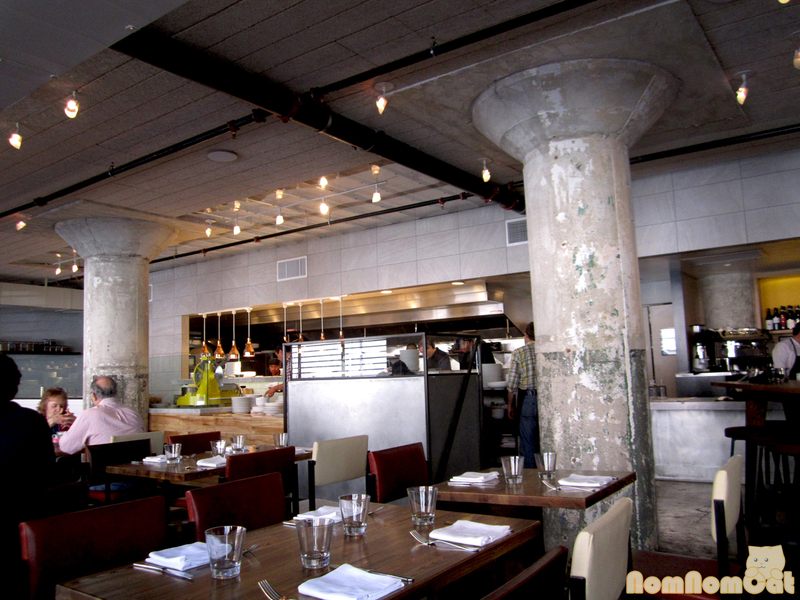 In a dining room that stays true to its concrete column and exposed ducting “look,” The Factory Kitchen’s menu features a variety of traditional dishes including a selection of handmade pastas. Martin had been here for lunch with his coworkers before and he raved about so much that we decided to dine here for a belated Valentine’s Day meal. Starter: focaccina calda di recco al formaggio – pizzata – crescenza, san marzano tomato, capers, anchovies, oregano. Martin suggested that we share a focaccina to start and he let me pick one. Lured by the prospect of anchovies and capers, I selected the pizzata. What is a focaccina? It was unlike anything I’d ever had, but I suppose the best way to describe it would be a very thin, very flaky and puffy flat-bread pizza. 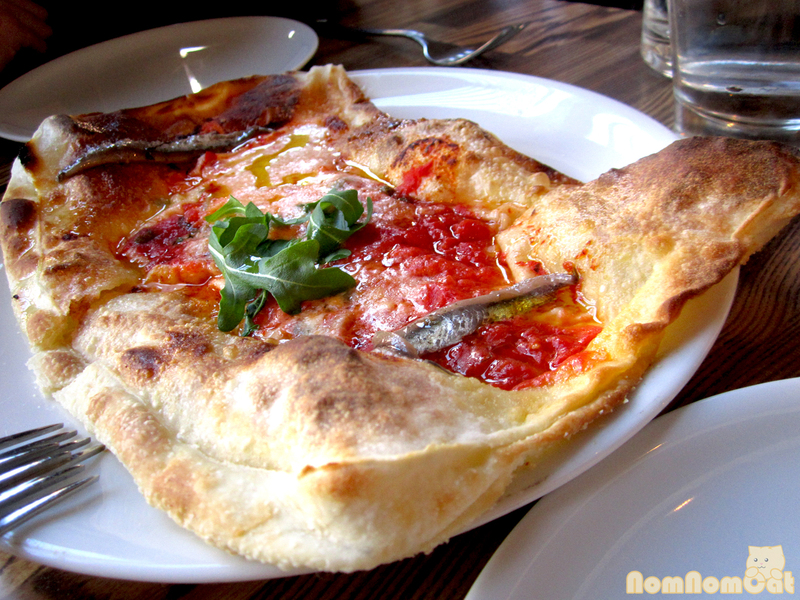 The pizzata was lightly sauced with a San Marzano tomato puree and decorated simply with a pair of anchovy loins. But the beauty is in its simplicity. It was so amazing I almost didn’t want to share. 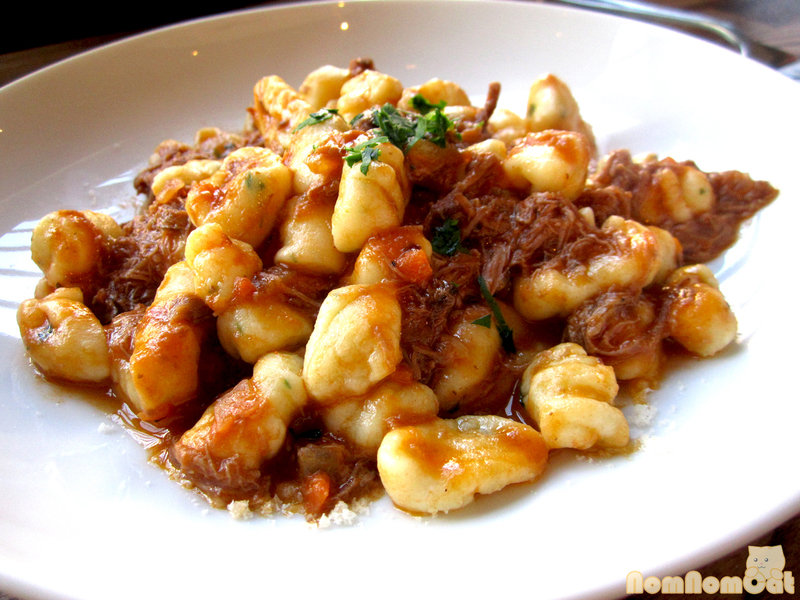 Entree (M): gnocchi malfatti – ricotta semolina dumpling, lamb sugo. I’m a big fan of ragu-type meaty sauces (and I don’t mean the stuff in the jar), so I had a feeling the lamb sugo would be a good choice. The ricotta gnocchi were very fluffy but also very cheesy. Martin, who is already a huge fan of potato gnocchi, really enjoyed this dish! 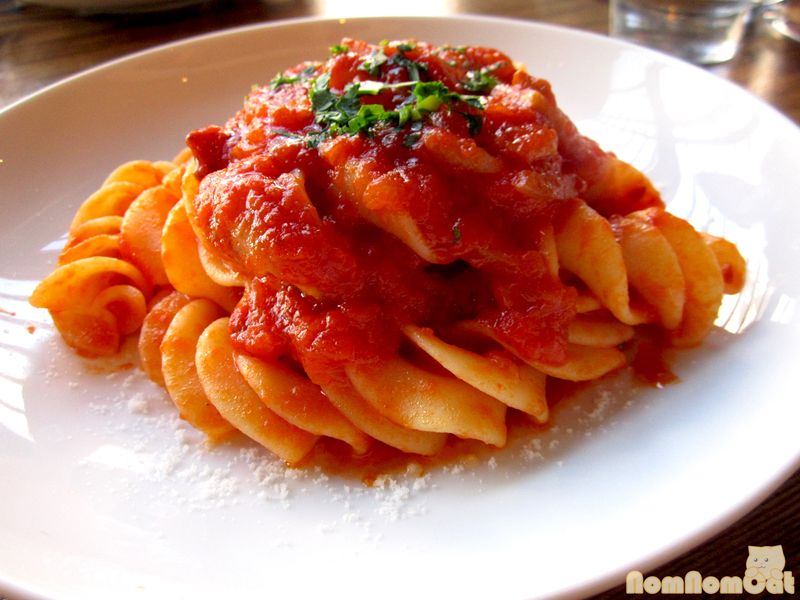 Entree (A): fusilli alla amatriciana – long corkscrew pasta, pork jowl, onion, spicy tomato. I needed only to spot the words “pork jowl” and I knew this would be the dish for me. There’s something inherently comforting about the flavor combination of pork fat and tomatoes, and this tender, fatty pork jowl did not disappoint. Also surprising were the long (VERY LONG) corkscrews; they were like rotini on steroids. So delicious I only wish there were more on the plate! 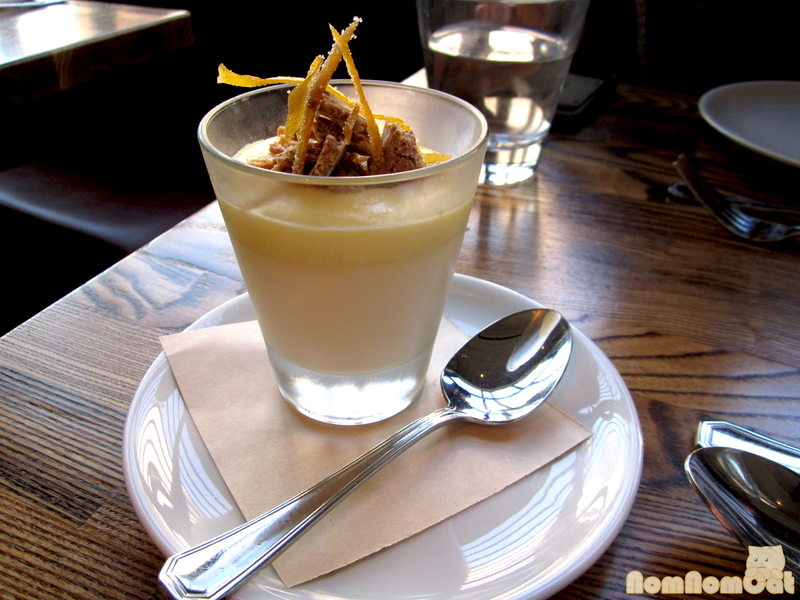 Dessert: pannacotta – meyer lemon curd, feuillitine crunch, candied zest. Another one of my buzzwords is feuillitine. Did I ever tell you about the time Martin and I made our own crepes dentelle? Now that was an adventure, but a story for another time. This dessert was love at first sight. Silky vanilla panna cotta topped by a thick layer of lemon curd… the combinations of tart and sweet, smooth and creamy… it was heaven on a spoon. I’m also a big fan of candied citrus, so I thought the zest was a great touch. 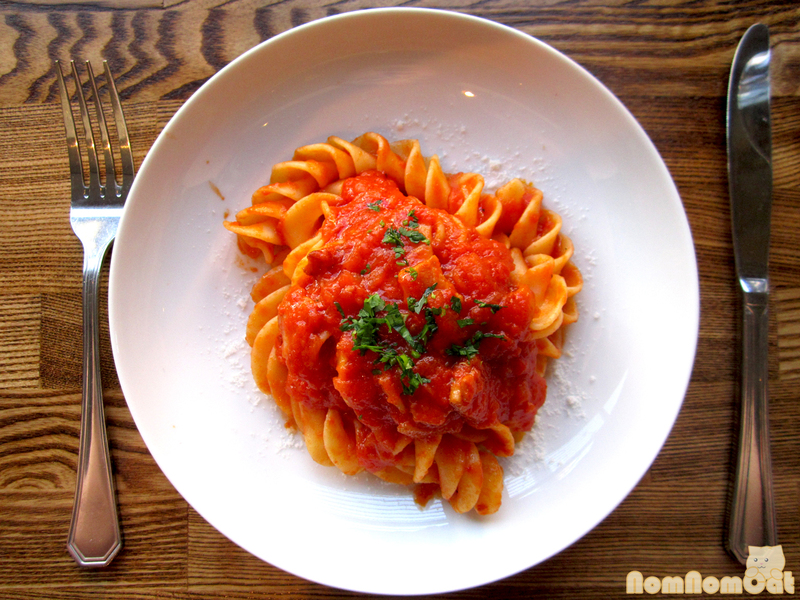 A wonderful meal, fabulously attentive service, and a taste of Italia in the heart of the industrial district… definitely swing by and check out The Factory Kitchen!